This hat will actually fit a range of ages. It was loose on my 13-month-old, and a tad tight on my 4-year-old, so I think this hat would fit great in between those ages. If you desire to go down or up a size, I would recommend going down or up a hook size. The multiples of 6 make it hard to make gradual adjustments. 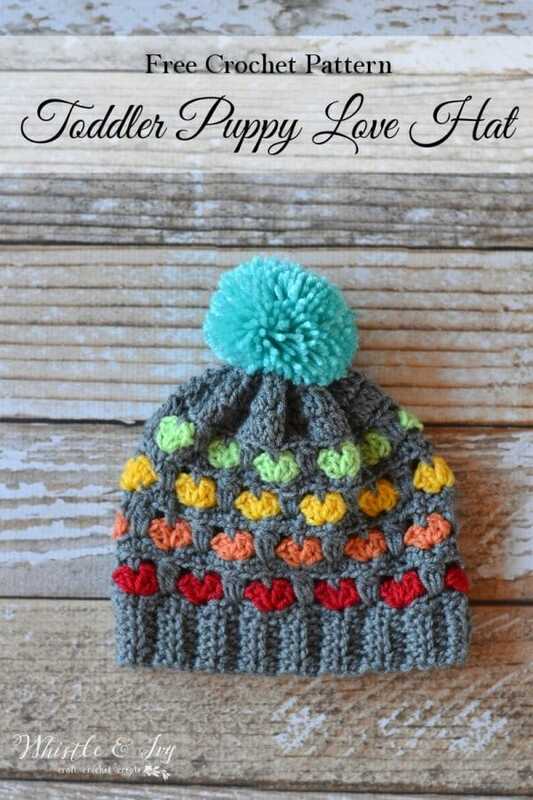 Toddler Puppy Love Hat – Approx 17″ circumference. Fold your piece in half, and sl st up the short side, forming a ribbed band. Fold over so your seam is on the inside. Continue on to the body without tying off. Body: (work row 1 across the top of the band, finding loops to work into, spaced as evenly as possible. 1. Ch 1. Sc in same space. Sc 66 around the top of the band. I worked an increase ( 2 sts worked in the same sp) about every 10 sts to be sure I could get the correct count. Join with sl st.
2. Join 2nd color. Ch 1. Dc 4 in same st. Ch 1. Sk 5 sts. *Dc 4 in next st. Ch 1. Sk 5 sts* work 10 times. Join with a sl st with first dc. (55 sts) Click over to the women’s hat for some visual help here. 5. Sl st 5. Join 3rd color in same st. Ch 1. Dc 4 in same st. Ch 1, sk 5 sts. *Dc 4 in next st. Ch 1, sk 5 sts* work 10 times. Join with a sl st with first dc. (55 sts) Tie off. 6. Join 1st color in the 1st dc of the shell before the join. *Ch 2. Sc in middle sp of shell. ch 2, work a 3-dc cluster in 3rd sk st from the previous round* work 11 times. Join with sl st. (66 sts). 8. Join 4th color. Work row 2. 9. Join 1st color. Work row 3. 11. Work row 5, joining 4th color instead of 3rd. 12. Join 1st color. Work row 3. 15. Ch 2. Dc2tog 22 times. Join with sl st. (22 sts). Tie off. To close the hat, saw a loose running stitch around the top of the hat and cinch closed. 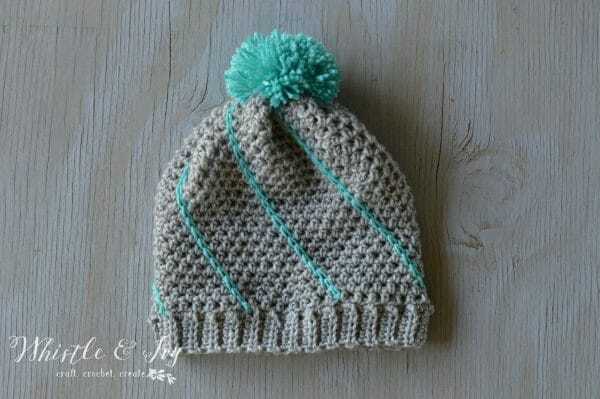 Finish by adding a pom-pom using this tutorial. 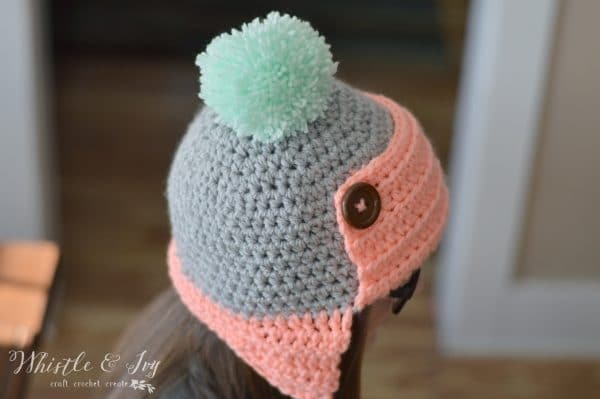 Show off your projects and meet other crocheters in the Whistle and Ivy Facebook crochet group, and subscribe to my weekly newsletter so you don’t miss any free patterns. Don’t miss these fun patterns! I don’t know how on earth anyone’s hat is big enough for anyone over 12 months. Its so small these 4 year olds must have tiny heads. I found some mistakes in the pattern that forced me to go to the adult pattern for the correct count. Before clising up the hole this hat was only. 5.25″ long and the brim is 6.75″ across so fits up to 16/17″ head circumference. Something tells me going up a hook size still won’t get this hat to fit a toddler. 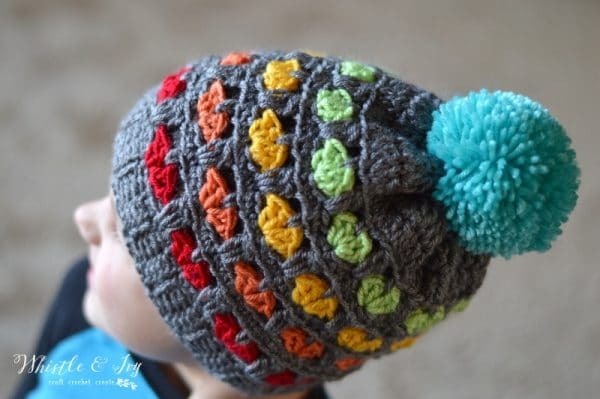 That being said, it produced a really beautiful baby hat, just disappointed I have to make another one and fiddle with the pattern to fit the 1 year old I’m making it for. I have no idea why mine is small and everyone else’s can fit a toddler. I used the I hook working the pattern as is except I added one more stitch to the band and it turned out beautifully for my four year old niece. She loves it! Thank you for the pattern! Hi! I’m not sure what I’m doing wrong. I can’t figure it out. I can’t get the 66 sts around the circumference. I can’t make the band bigger than the 35 rows because it’ll be too big. Also, as I’m working on the body it keeps increasing. For example, the number dc clusters in the 1sr row is 10 and the 2nd turned out 12 (?). Sounds like everyone got it but me. 😫 Help!!!! The band is fine, you can adjust that number to work for you. Getting 66 for the first row is a bit a trial and error, you can work increases if you need to, but getting 66 in vital to make the pattern work. This might be where you are getting off. I’m on round 4 but I seem to have too many stitches. I get 89. Am I supposed to skip something chains, sc, dc? How many sts did you have in row 3? Sk means skip, so you will be skipping stitches in round 2. You should have 55. Sk means skip. So when the patterns says sk 5 sts, you will skip 5 sts. Love your pattern here! What colours of yarn do you suggest for a girly hat? Just omit 2 of the dc rounds after the hearts and it will be more fitted. Hi! Thank you for the pattern! How do you close the hat off at the end? I have the correct stitch count, but it has a gaping hole at the top. Please help! 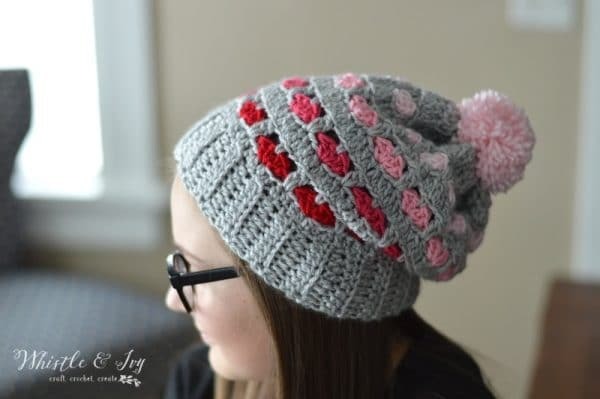 Ps otherwise adorable hat and very easy to follow pattern! Thank you!! Oh my goodness! This hat has been on my site for some time now and no one has noticed I forgot to explain how to close that hat! Thank you for brining that to my attention! To close it, you sew a simple running stitch around the top of the hat and cinch it closed, but pulling the ends of the yarn. Thanks for your patience! I am glad you like the pattern! What size is an h crochet hook? Ours come in metric sizin. Loving your great patterns and generosity. I’m working on last week’s. Love it! I really love the look of this hat. But I keep running into a mistake I don’t know what I’m doing wrong. After round 1 of the body I have 66 chains but after round 2 (I stick to the instructions or I think i do) i have 12 shells?!? Help? Hm. I am not sure! You should have 11. How many sts do you have? Are you skipping the right amount in between the shells? Oh no I am sorry! That is frustrating :( I am glad you like the pattern though! No need to apologize! Someone will enjoy it! And now that I have one down the other is going very quick. Pattern is very easy to follow – will certainly enjoy more of your patterns. 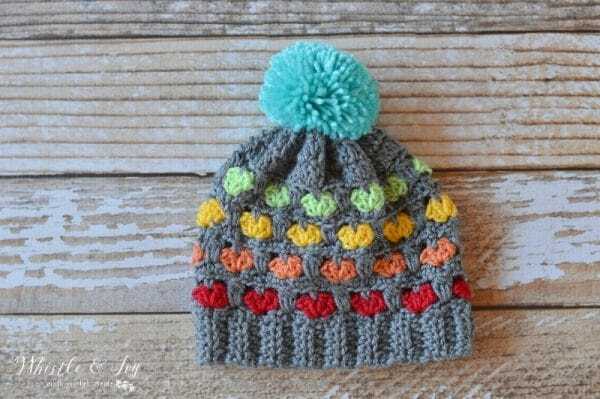 This is so sweet hat! Thank for sharing. In the body, in round 3, are you supposed to switch back to the original color? Yes! I’m sorry for the mistake. Awesome! I love your patterns! Thank you! And thanks for your patience! You start at the bottom of the hat and not in the round? I swear I absolutely love love love your patterns!!!!!!!!!!!! Thank you so much Magaly!! You are so sweet!! Oh my goodness, this is too cute; I’m definitely going to make one for my daughter! Hi! Looks like you do BLO in round 4 of the body, but you don’t mention that in the pattern. Such a cute pattern either way! Confused as it doesn’t say when to change to color in beginning of pattern. Please help. I really want to make this. Sorry about that! I fixed it. Thanks for letting me know! Thank you. I can’t wait to make this for my daughter and nieces. Omgosh, this is so adorable! I absolutely love it. Thanks for sharing at Merry Monday! Thanks so much! Thanks for hosting!